Within about 2minutes of being on the track you hit your first obstacle. 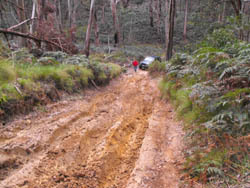 Fairly steep rutted, boggy and slippery hill climb. Good clearance and a decent set of rubber should see you tackle this without too much drama. The rest of the track was fairly straight forward rocky and a little rutted in places.